August’s Book of the Month is the long awaited Philippa Gregory novel “The White Queen” which I’ve had the pleasure to read and review, courtesy of Simon and Schuster UK – thanks! 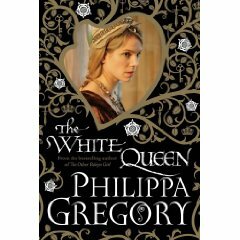 The White Queen by Philippa Gregory – Out 18th August! Historical fiction fans all round the world are eagerly awaiting publication of this latest Philippa Gregory novel on 18th August – the first in a new series of novels on “The Cousins’ War” or the late Plantagenet period of history. The setting for this wonderful novel is the time of the later Plantagenet rulers. This period was just prior to the War of the Roses, the struggles between two royal houses, the House of York and the House of Lancaster, which Henry VII famously brought together by marrying Elizabeth of York, daughter of Edward IV and his wife Elizabeth Woodville, the heroine of “The White Queen”. Gregory has named this series of novels “The Cousins’ War” because this war was between brothers and cousins, not countries. Families were torn apart and sides were swapped all of the time. The novel starts with a wonderful opening page that introduces the reader to the legend of Melusina, a water goddess from whom Elizabeth Woodville believes she is descended. This opening sets the tone of the book as it is an exciting recipe of witchcraft, myths and legends, war, intrigue, history and love – a recipe that Gregory has got just right. From this mythical start, we are launched into the story of Elizabeth Woodville, her love for Edward IV and the struggles of the King and the Woodville family against the many challenges to the throne, which don’t just come from abroad but that come from within the family. We are also introduced to famous historical characters like the Kingmaker (the Duke of Warwick), the Princes in the Tower and the future Richard III. This historical story is mixed with legend and witchcraft as Elizabeth and her mother Jacquetta draw on their mythical ancestry to control the future. I thoroughly enjoyed being swept into this period of history, a time that I have not visited since my A’ level history, rather a long time ago! “The White Queen” is a fast-paced journey into the past and Gregory, as always, captures the reader’s imagination – she grabs you and doesn’t let go until the final page, so be ready to give up the rest of your life to concentrate on this book! Gregory’s publisher for this novel, Simon and Schuster, are teasing the public with excerpts on their website, audio extracts on YouTube and interviews with Philippa Gregory on YouTube (see links at the bottom of this page), and there is already a significant amount of controversy over this novel with its depiction of Elizabeth Woodville and her mother, Jacquetta Woodville, and the sorcery they use to make their way in the world. The women’s link to witchcraft is a rumour that has circulated since Jacquetta was accused, and then acquitted, of witchcraft, during her marriage to Sir Richard Woodville, and Elizabeth Woodville was accused by Richard III of using sorcery to bewitch Edward IV and to seduce him into marriage. Although it appears that these rumours are unfounded, Gregory uses them in her novel as an integral part of the story. People who like their historical novels to be simply a retelling of a factual story may get annoyed by this reference to rumour and scandal, but I love this mythical side to the novel. The first in a stunning new series, The Cousins War, is set amid the tumult and intrigue of The War of the Roses. Internationally bestselling author Philippa Gregory brings this family drama to colourful life through its women, beginning with the story of Elizabeth Woodville, the White Queen. The White Queen tells the story of a common woman who ascends to royalty by virtue of her beauty, a woman who rises to the demands of her position and fights tenaciously for the success of her family, a woman whose two sons become the central figures in a mystery that has confounded historians for centuries: the Princes in the Tower whose fate remains unknown to this day. From her uniquely qualified perspective, Philippa Gregory explores the most famous unsolved mystery, informed by impeccable research and framed by her inimitable storytelling skills. Does it make you want to research the characters more? Well, “The White Queen” ticks all of the boxes and I heartily recommend it to all those who enjoy the very best of historical fiction. Follow Philippa Gregory’s tweets between Tuesday 11th and Monday 17th August to see the character of Elizabeth Woodville brought to life in the countdown to the release of “The White Queen”. Gregory will tweet the story of The White Queen, daily between 5:00pm and 8:00pm and you can follow them at www.twitter.com/ElizWoodville. The tweets will remain for people to view at a later date on Gregory’s re-launched website: www.philippagregory.com. Read a text excerpt on the Simon and Schuster website – click here to read it now. Watch interviews with Philippa Gregory on YouTube – click here to go to the first one and then see the list on YouTube for more interesting videos. Buy the book – Click here to preorder it from Amazon US or click here to preorder it from Amazon UK. It’s out on 18th August!